I find it interesting at times to put famous people into a broader historical perspective. Given this is an election year, I can't help but think about the Presidency and that got me wondering what Presidents were alive during Houdini's life. 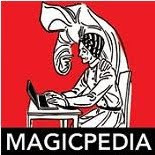 Houdini had a connection to all the Presidents of his time right down to George Washington, which I'll share with you at the end of this story. But for now, let's look at the timeline. Houdini was born in 1874. At the time of his birth Ulysses S. Grant was the current President. He would serve until 1877. 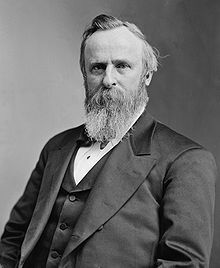 However, Houdini, then Erich Weiss, would not arrive in the U.S. until July of 1878, so the first President he would have encountered from when he was in this country would have been Rutherford B. Hayes. 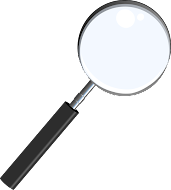 President Hayes is the person credited with starting the tradition of the annual Easter Egg Roll on the White House Lawn, an event that has featured many magicians since it began, though Houdini doesn't appear to have ever participated. President Hayes served until 1881 when James Garfield took over to become the 20th President of the U.S.. Houdini had a unique connection to Garfield. President Garfield only served for five months. On July 2, 1881, Charles Guiteau shot the President at the 6th Street Railroad Station in Washington. Guiteau the deranged assassin was disgruntled because he wasn't given a job within the government. The President lived until September 19th, 1881. In November, Guiteau finally went on trial, for murder. Houdini, in January 1906, was challenged to escape from the cell that once held the assassin of President Garfield at the D.C. Jail. Houdini, not only freed himself, but also unlocked several other cells and had prisoners change cells with one another. The Houdini movie with Jonathan Schaech opens with a scene that I think is a recreation of this escape. Chester A. Arthur would take over for Garfield, and would serve as President during the time that young Erich Weiss became known as 'Erich, Prince of the Air'. Grover Cleveland was the next President, followed by Benjamin Harrison. When Houdini and Theo and Jacob Hyman went to work the 1893 Chicago World's Fair, Grover Cleveland became President, again. When Houdini got his big break from Martin Beck in March of 1899, William McKinley was serving his third year as President. McKinley would be assassinated in office by an avowed anarchist. His Vice President Theodore Roosevelt would follow him and serve two terms as President till 1909. 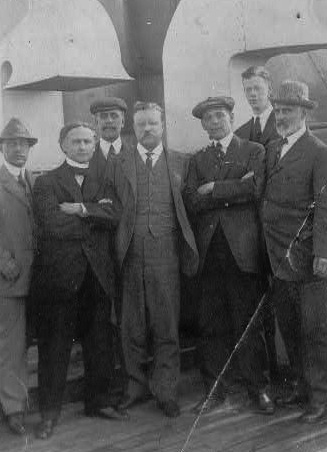 A few years later, Houdini while sailing aboard the Imperator from England to America, had the good fortune to meet the former President Roosevelt and perform for him as well. Houdini totally baffled the former President and before landing in the U.S., he made sure to have his photo taken with Roosevelt. The photo today is interesting as two versions exist. One with Houdini, President Roosevelt and a number of other gentlemen, and the other version is of Houdini and the President with all the other people airbrushed out! William Howard Taft was President from 1909-1913. During that time Houdini became the first person to fly an airplane in Australia thus making him a pioneer aviator. He also introduced the USD or the Upside Down Water Torture Cell during Taft's tenure as President. On March 4th, 1913, Woodrow Wilson would be sworn in as the 28th President of the United States and a few months later, Cecelia Weiss, Houdini's mother would pass away, changing his life forever. President Wilson would often sneak over to the Keith's Vaudeville Theatre in Washington D.C. to see Houdini perform. The theatre was easy walking distance from the White House. Houdini also received an invitation from President Wilson to come to the White House. When World War I broke out, Houdini enlisted but was too old to be considered. Instead, he got behind President Wilson and the war effort by selling Liberty Bonds and performed at military bases across the country to support the troops. He also made an Elephant Vanish and began his movie career during the Presidency of Woodrow Wilson. Warren G. Harding was the next President serving from 1921-1923. He died during his third year in office. Houdini met Sir Arthur Conan Doyle during this time and had the famous seance in Atlantic City with Doyle's wife. Calvin Coolidge was the Vice President for Harding, so when Harding died in 1923, Coolidge became President. 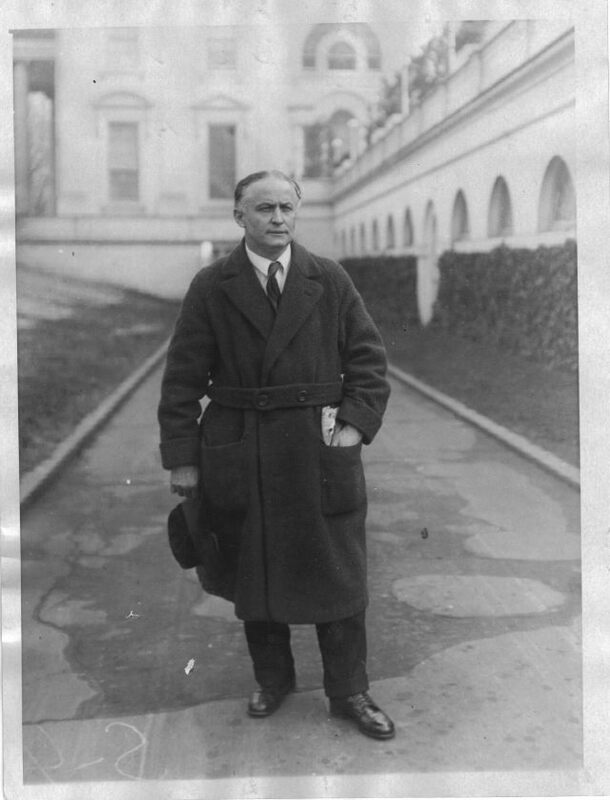 He served until 1929, so that made Coolidge the final President during Houdini's life. Though he was friendly with Roosevelt and Wilson, I can't help but think that the Coolidge and Harding Administrations didn't take too kindly to Harry. He had testified before Congress about the Anti-Fortune Telling Legislation and it was revealed during this time that seances had taken place at the Coolidge White House, which later was changed to the Harding White House. But it was bad press for the executive branch either way. 1912 The sinking of the RMS Titanic. Houdini's friend Charles Carter (Carter the Great) tried unsuccessfully to board passage on the Titanic. 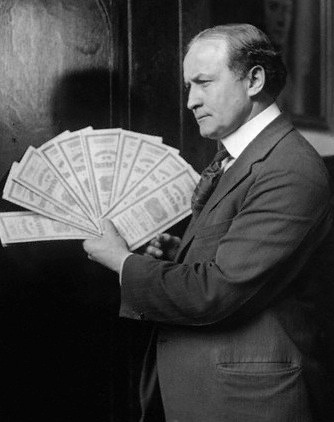 1926 -Oct 31 Houdini dies. Houdini missed Charles Lindbergh's historic first transatlantic flight by only a few months. And he missed the Stock Market Crash of 1929 by three years. If you are wondering what Houdini's connection was to all the President's from Washington to Coolidge was, well he was an avid collector of many things and one of his collections consisted of signatures of all the Presidents. I wonder where that collection is today? According to the Silverman Biography on Houdini he even had signatures of John Wilkes Booth and his brothers. Houdini's boyhood idol happened to be Abraham Lincoln, who had only died 9 years before Houdini was born. Another way of looking at that, Houdini was born 9 years after the end of the Civil War. He's such a modern figure, I never really considered that he was born so close to the War Between the States. Houdini loved America and American history. One thing I really admire about Houdini in this regard is how though he knew politicians, Congressmen, and Presidents, he stayed out of the political arena. He visited both the White House and Congress and he was welcomed by people from all parties, but he never publicly took sides. He surely had political opinions but he kept those private and used his celebrity status to promote one thing, HOUDINI. *Thanks to WildAboutHoudini.com for the use of the top picture.